This coming Saturday’s game could be one of the most important in the very short reign of Jim Harbaugh being coach of the Michigan Wolverines. In order to not hear Michigan fans have a complete & utter meltdown all the way around, Harbaugh has to coach the team to a victory against Oregon State (Noon, ABC). Michigan football coach Jim Harbaugh has to lead the Wolverines to victory against Oregon State or face the chirping of Michigan fans who will start to question the hire. The Michigan fans around the country have hailed Harbaugh as the savior & the guy who is going to bring Michigan football back to its glory days of Lloyd Carr & Bo Schlembechler. The boldness & the attitude that Harbaugh brought into the Michigan program, with the camps in SEC territory, the wild stories written about him, his stance on showing the American Sniper movie to his football team when the rest of the Ann Arbor community wasn’t showing it – it shows that he has worked to connect with students, alumni & fans alike. But if this team starts off 0-2, the opinions & complaining will surface quickly. Last week’s game showed a few glaring holes but also many bright spots in the Michigan team that fans may or may not think about when having Harbaugh on such a high pedestal. Michigan looked strong on defense against Utah, allowing 337 total yards, which, under a new coaching staff & in the first game, that’s an amazing feat. The defense looked inspired & looked ready for the upcoming season. The offense is what the fans & media has been talking about the most, however. Graduate transfer quarterback Jake Ruddock was very mediocre on Thursday night, throwing for 279 yards & 2 touchdowns, but threw 3 bad interceptions. The interceptions were bad in the sense that twice it was on their freshman receivers cutting off their route, showing that they were not in strong connection with each other, which can be a reflection of preparation during the week & offseason. The 3rd interception was a pick-6 that Ruddock has to know better on. Many Michigan fans may say that Harbaugh needs time to find the quarterback he needs on his team to make the system go well & Ruddock or Shane Morris may not be the guy this year. But still, Harbaugh has to find a way to lead this team to victory against a legit Pac-12 opponent in Oregon State. Are the expectations a bit out of proportion? Of course. But Harbaugh brings that expectation with winning in college & getting to a SuperBowl in the NFL. 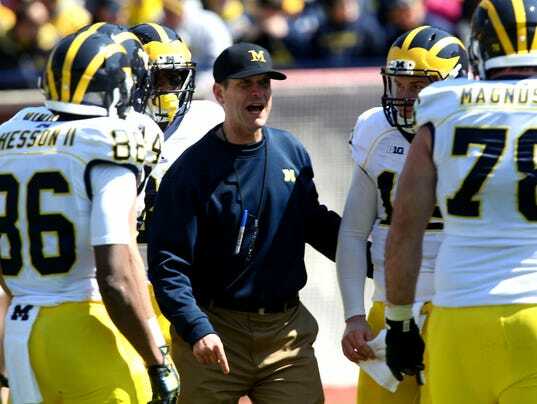 He brings credibility & most importantly for Michigan fans, hope. Hope of a Big Ten Championship soon. Hope to be back in the BCS picture in some way, shape or form in the near future. Hope that Michigan can be……..Michigan again. 0-2 will quickly make people think about the Brady Hoke & Rich Rodriguez years, which no Michigan fan can yell “Go Blue” to.